Green Thumbs are Twitching at Coverdale Farm Preserve! Spring has just arrived…HOORAY! However, at Coverdale Farm, we have been working as if this verdant season has been here for weeks! Our 352-acre preserve is a dream-come-true for the green thumbs on staff that grow food for our CSA members; grow gardens to teach children about food plant life cycles; grow feed for our livestock; and manage the natural areas for biodiversity. Timing is everything to make these gardens and fields thrive. Working early in the cold winter months we comb through seed catalogs; make field maps and garden plans; and devise management strategies to generate abroad range of desired products: organic vegetables, plant based “classrooms,” nutritious hay, and wildlife habitat. Here’s a brief peek into what it takes to make the farm a booming center for food and ecology. By the time we have rung in the New Year, CSA Farmer Dan O’Brien has already ordered his seeds, planned his field rotations, and created his planting timeline. Several weeks ago Dan sowed several hundred vegetable seeds indoors in starter trays sandwiched between heat mats and lights. He worked with a local grower in Pennsylvania to raise thousands of plants that will eventually find their way into our 7-acre CSA site. Within the last month, as soon as the soil could be worked, Dan was out preparing the field for planting. He has already sown hearty cool- loving crops like peas, potatoes, carrots, and beets. In February Dan and DNS Land Management staff members Steve and Josh, built a 2,000 square foot hoop house. This unheated, protective structure will allow Dan to extend the season of certain crops like tomatoes and cucumbers. The hoop house enables these “high summer” crops to be transplanted out earlier in the spring and remain in the field longer in the fall. In addition to this new house, Dan has 2 other hoop houses that he will use for season extension and seed germination. We still have shares available for the 2013 CSA season. Please visit our website www.delawarenaturesociety.org under “conservation corner” for registration details. 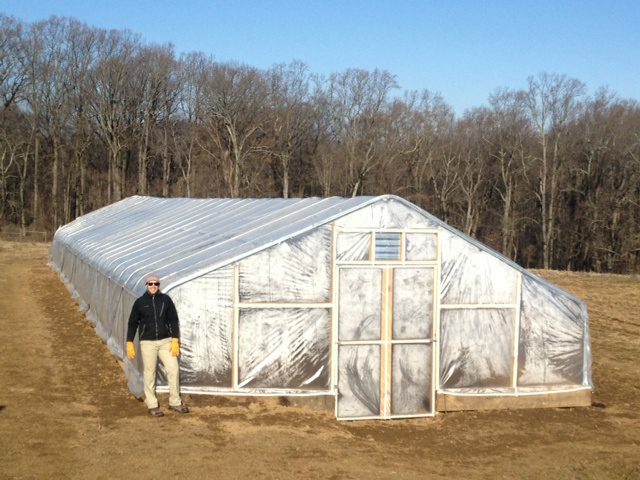 CSA Farmer Dan O’Brien with his shiny, new hoop house. Photo by Steve Johnas. Grey winter months set Farm Program Coordinator Michele Wales to dreaming of purple carrots, orange eggplant, and hundreds of heirloom tomatoes in all colors but red. Striving to show the genetic diversity of common and not-so-common foods that can be grown in our region, Michele focuses primarily on growing heirloom varieties. The goal of the 1 ¼ -acre education garden is to show all stages of the plants’ life from seed to flower, to fruit, and back to seed. This area of the farm grows an endless list of earthly delights like strawberries, rhubarb, and grapes to tomatoes, basil, potatoes, saffron, and lots of flowers. Seeding begins in the dark days of winter in an 80-degree greenhouse space generously provided by Gateway Garden Center. Michele sowed close to 900 seeds in mid-March, will transplant the thriving seedlings in April, and bring them to the farm in May. The garden will come alive through the work of children and farm education staff sowing seeds and heeling in transplants after the danger of frost has passed. Thanks to Gateway Garden Center in Hockessin (www.gatewaygardens.com) for the greenhouse space and seeds to help our gardens grow! Farm Program Coordinator Michele Wales seeding heirloom tomatoes. Photo by Jim Wolfer. In late January and early February, Farm Steward, Jim Wolfer keeps his eyes on the ground and ears tuned to weather forecasts. Jim is looking for snow-free acreage and temperatures that reach above the freezing point. During periods of freezing and thawing, Jim will sow the seeds of red clover in our 9-acres of feed hay fields. This is known as frost seeding and is a method that this plant needs for successful germination. By March, on dry ground days, he is mowing down crop “residue” like corn and sunflower stalks from last year as well as spreading our farm-generated compost. By late May he will be mowing the hay, bailing it, and storing over 15 TONS of it in the stone barn to feed our cows and sheep next winter. Farm Steward Jim Wolfer surveying the winter hayfield. Photo by Dan O’Brien. In the late fall of 2012, Land Manager Dave Pro was drilling the seeds of over 15 species of native grasses and wildflowers into 25 rolling acres of former agricultural fields. For the last 15 years Dave has been working to transition farm fields into native meadows that provide rich habitat for ground nesting-birds, mammals, and a wide diversity of insects including native pollinators. Gearing up for the growing season, Dave spent hours in March mowing down last year’s growth to open the landscape to the sun’s rays and to control woody shrub invasion. In addition to mowing, these native meadows thrive and excel against competitors through the implementation of fire. Dave schedules the early spring prescribed burn by paying attention to several key factors: wind speed, wind direction, humidity, precipitation, and the emergence of new plant growth. Once these factors have aligned, a regional team of highly trained wildfire fighters descend upon the preserve to artfully and safely employ this management technique. If all of the necessary criteria are met Dave and his skilled crew will be setting fire to 6-acres of well established meadow as early as this Thursday, March 28 or a date to be determined the week of April 1. We invite you to witness this exciting event. Please call 302.239.2334 to register. Space is limited. This very spontaneous offer is FREE with details to be communicated as soon as we have them to share. Land Manager Dave Pro keeping a few steps ahead of a meadow fire. Photo by Derek Stoner.